The World Health Organization is warning that an outbreak of avian flu poses a serious threat to the South East Asia region. The disease, which has infected millions of chickens across Asia, has so far killed 10 people, with other cases suspected. Countries across Asia are battling to stop the spread of the disease by culling poultry. A different strain of the disease killed six people in Hong Kong in 1997. BBC News Online examines the disease. 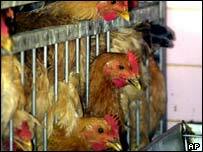 Avian flu was thought to infect birds only until it jumped the species barrier for the first time in Hong Kong in 1997. It has been known for some time that a wide range of influenza viruses circulate in wild birds. Subtypes of the influenza A virus known as (H5N1) and (H9N2) have been known to infect humans. And in April last year a Dutch veterinarian who had been working on a farm infected with bird flu became ill with a strain (H7) of the disease and died of pneumonia. The outbreak - of the H5N1 sub-type - went on to kill six people and infect 12 others in a small but densely populated area. Nine cases were children under the age of 10. In March 1999, there were two cases of human infection by the H9N2 strain, also in Hong Kong. Both viruses were known to be circulating among chickens in Hong Kong, and some of the cases were known to have had contact with poultry before they became ill. Although it was not possible to establish how every case became infected, it is most likely that the individuals who contracted avian flu did so directly through exposure to chickens. However, there was no evidence of wider spread and no evidence of human-to-human transmission with either strain. It is also clear that transmission from birds to humans is a rare event. But the WHO has warned that avian flu does have the potential to be more serious than the Sars virus which emerged in 2003, if it mutates into a more lethal form or a form which can pass from human to human. The fear is that the more widespread it becomes the more chance there is that it could alter its form. WHO are particuarly concerned about the virus' potential to swap genes with a common flu virus, creating a lethal pathogen that could spread around the globe within months. no central slaughtering facility for chickens, and the practice of slaughtering chickens at the retailed outlets is highly unsatisfactory. The symptoms of H5N1 are very similar to other influenza viruses, typically with fever, malaise, myalgia, sore throat and cough. Conjunctivitis is seen in some patients.